The first time I had Cacio e Pepe in Verona, I knew I had fallen in love. So simple, yet purely delicious. I was agog to discover that this silk smooth cheesy extravaganza is made with FOUR ingredients: pasta, pepper, pecorino and water. Hell. Even I could do that. Surely. I even looked up a recipe. At home, I never cook (except for baking) following a step by step actual recipe. I tend to sort of, you know, wing it. A little of this, a little of that. Well, that strategy certainly was not working for me in this case. 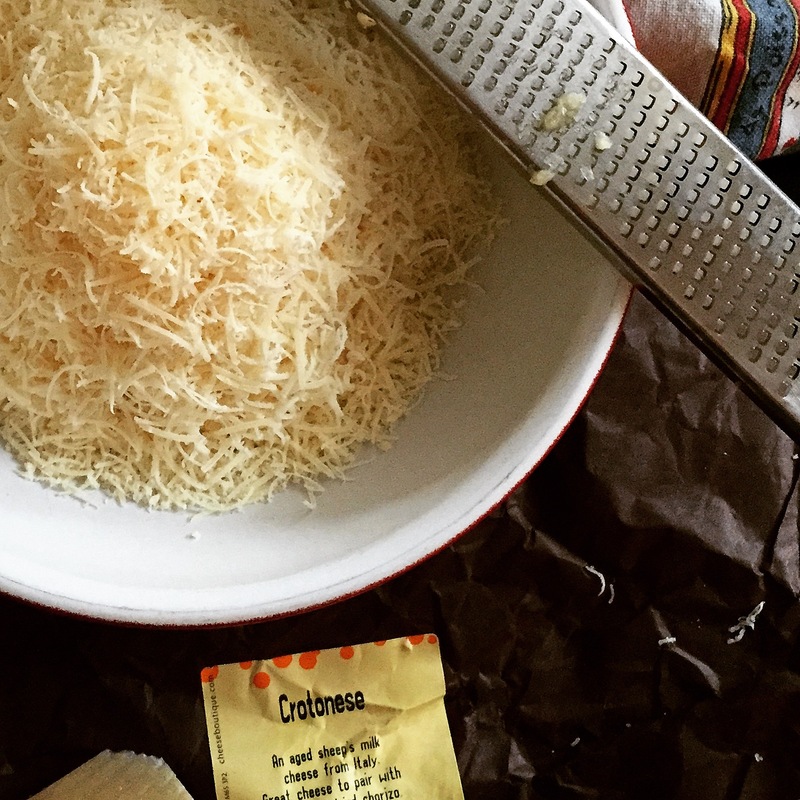 The Pecorino clumped together and stuck to the pan. It was neither silky smooth nor extra cheesy. It was not pretty. And so began my obsession quest to make perfect Cacio e Pepe at home. Cacio e Pepe is a Roman dish, and to me epitomizes the wondrous ability of the Italians – no matter the region – to make something mouth-watering delicious out of very little. In Italy a few weeks back I quizzed everyone I met. The cooking of Italy is so damn regional, many people in the north did not know what it was, but I managed to pick up these two invaluable tips. 1. Traditional sheep’s milk Pecorino Romano (as in what all recipes call for…), typically aged minimum 5 months, is too old for Cacio e Pepe……around Rome the younger sheep’s milk cheeses are used in the dish, with Pecorino Romano passed around the table for those wanting a little more cheese. 2. It was painstakingly explained to me that temperature is everything. Too hot and the cheese clumps together. (Oh yeah. Had that happen.) Too cold and the cheese does not melt. (Yup, that too.) I was told to be patient. Let the pasta drain a minute before tossing it in the pan. Armed with this information, I got back to work in the kitchen, and learned a few other things. The kind of pasta is essential. You really need a spaghetti that has a wonderful texture – this dish needs to be al dente – it provides the perfect compliment to the creamy cheese that clings to it. 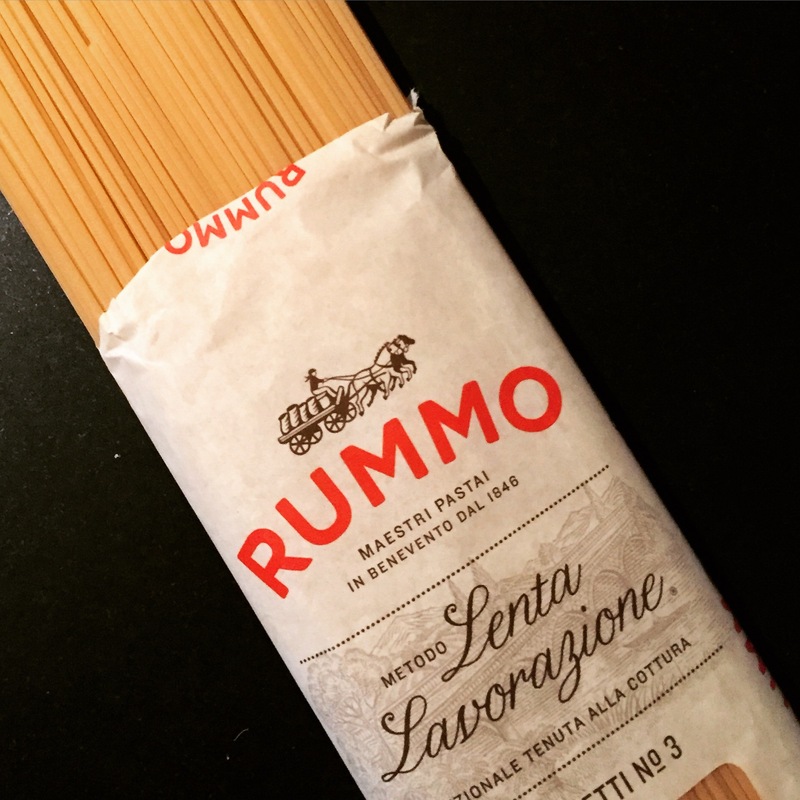 My favourite for this is Rummo – they’ve been making pasta since 1846 and pride themselves on the texture of their pasta. Cheese is everything. My best success time and again was with Pecorino Crotenese. 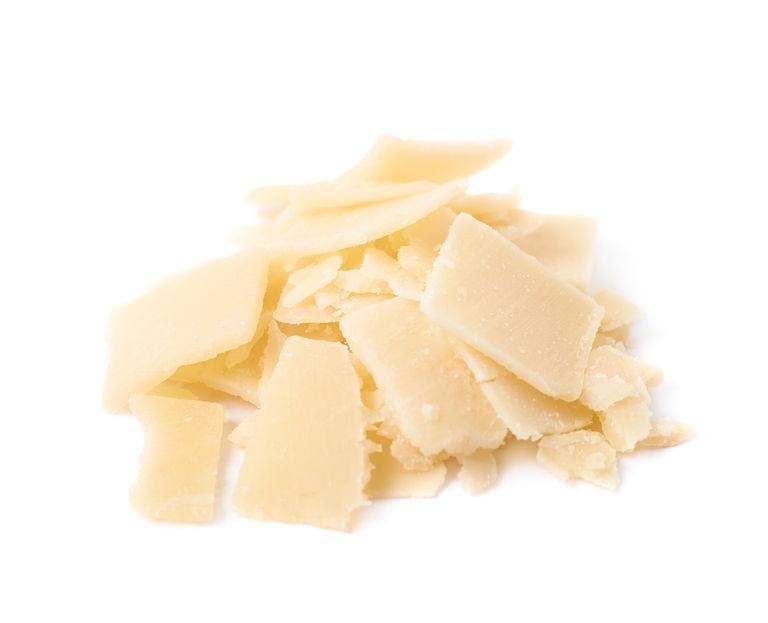 It is less dry and crumbly than Pecorino, but with an incredible flavor. Those Sardinian sheep have it all going on. 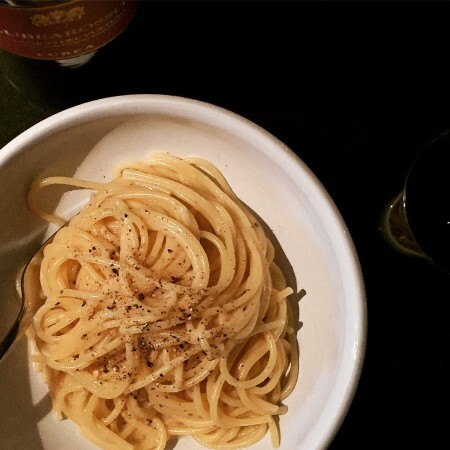 Cacio e Pepe made with Crotenese and then topped with aged Pecorono Romano or Pecorino Toscano – winners. I can’t say enough about temperature. It’s the Goldilocks of dishes. Too hot, game over. Too cold, go home. You’ll probably do way better than me and nail it on first try – but if you don’t go back at it. • Bring 3 quarts water to a boil in a 5-qt. pot. • Cook pasta just 1-2 minutes shy of the cooking instructions, approx. 7 minutes. • Meanwhile, set large shallow pan on lowest heat possible. • Add Extra Virgin Olive Oil and all but half a dozen pieces of the butter. • Don’t let butter brown…..just melt with a little heat to help extract the essential oils of your black pepper. • When the pasta is quite al dente, dip 2 cup measure into the pot, scooping up just over a cup of the cooking water. 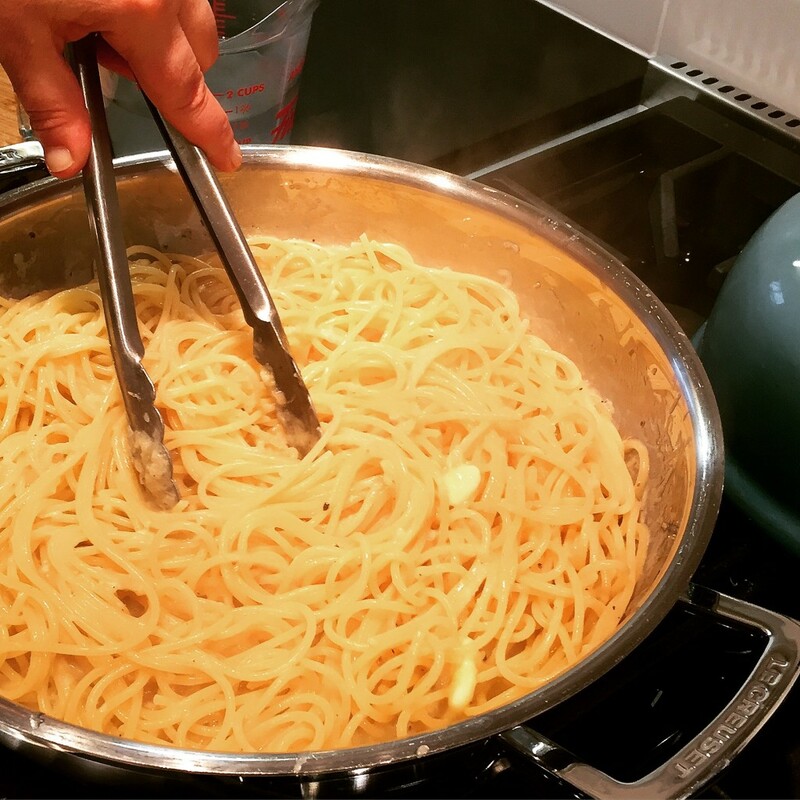 • Pour ¾ cup of this reserved pasta water into your pan with the butter, olive oil and pepper and bring to a boil. • Take a sip of wine. Tell people to come to the table. NOW! Cacio e Pepe waits for no one. • Add drained pasta and reserved still-cold butter to pan and toss well to coat each strand with water/oil/butter/pepper. • Behold the creamy sauce created by the combination of wet pasta and dry cheese. • Serve immediately in warm pasta bowls. Have extra pepper, Pecorino and Maldon Sea Salt on hand for those who don’t find your seasoning absolute perfection. Let me know how it goes. Buon Appetito.